'You can choose between REACTING to people or situations or ACTING DELIBERATELY. 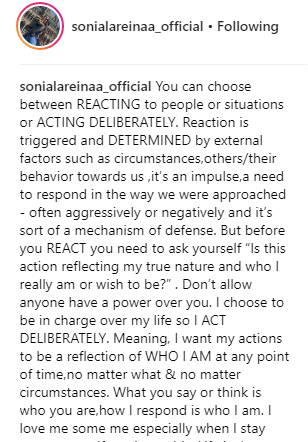 Reaction is triggered and DETERMINED by others/their behavior towards us, it’s an impulse, a need to respond in the way we were approached - often aggressively or negatively and it’s sort of a mechanism of defense. But before you REACT you need to ask yourself “Is this action reflecting my true nature and who I really am or wish to be?”.